Jessica, 17, previously won the Arts award in 2004. 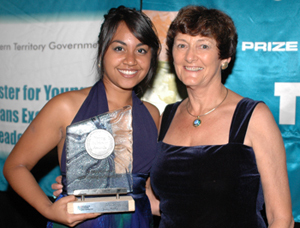 The Young Achiever Awards acknowledge, encourage and promote the positive achievements of young Territorians between 14 and 26 years of age. Jessica became a household name last year when she reached the final of Australian Idol – a program watched by millions. She began her singing career at a very young age, and has won numerous awards and was nominated for the Tamworth Country Music’s Festival Golden Guitar Award. She recently released a CD based on her Idol journey. As the winner of the Charles Darwin University Arts Award, Jessica received a $1000 TIO Online Saver Account and a magnificent trophy.